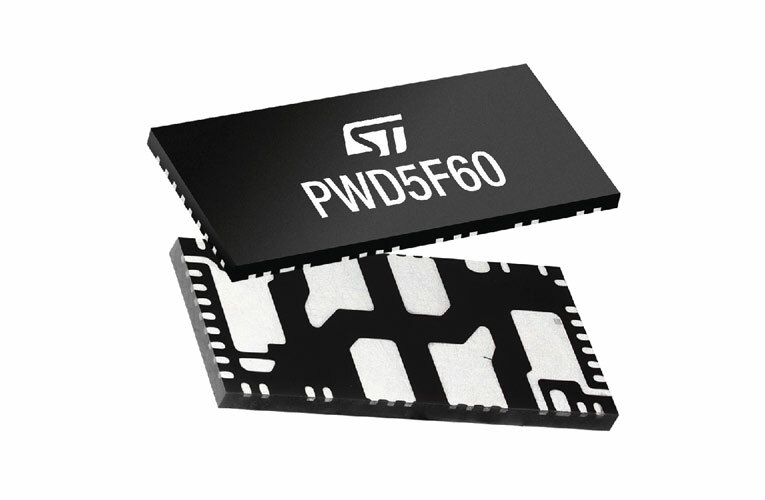 STMicroelectronics introduced a high-density power driver PWD5F60 intended to be used in high-voltage brushed DC and single-phase brushless motor applications. It integrates a 600V/3.5A single-phase MOSFET bridge with gate drivers, bootstrap diodes, protection features, and two comparators in a 15mm x 7mm outline. The thermally efficient system-in-package occupies 60% less board space than discrete components, while boosting reliability and simplifying design and assembly. As a single-phase full-bridge module, the PWD5F60 is designed mainly focusing on driving brushed DC motors in applications such as industrial pumps and fans, blowers, domestic appliances, and factory-automation systems. It is particularly targeted at the appliances using single-phase brushless motors that guarantee high durability and efficiency at a reasonable cost. It is also cost-effective and convenient for use in power supply units. Cross-conduction prevention and under-voltage lockout are already built-in to protect the device by preventing operation in low-efficiency or dangerous conditions. The PWD5F60 is in production and available now, packaged as a multi-island VFQFPN device, from $2.15 for orders of 1000 pieces.